This tagger size scrap kit is exactly what the title says. It's trouble bubbling with it's 93 elements and 17 papers. Not all are shown and are saved at 300 dpi. You'll hear the screams. You'll hear the cackling. You'll hear chains rattling as you open the file and walk past the haunted house, the headless horseman, ribbon bows, creepy trees, and flying witch. Don't get too close to the bubbling cauldron. You just may get hexed by one of the spell books laying nearby! There's so much more haunting fun in this kit that it'll be sure to bring out the ghoul that lies in all of us! This totally awesome tag, "Double Trouble" was created by Sharon of Tagalicious Tags & Tuts. This eerie as well as creepy tag, "Troubling Bubbling Brew" was created by Amy of Amy & Leah's Gimptastic Tuts. 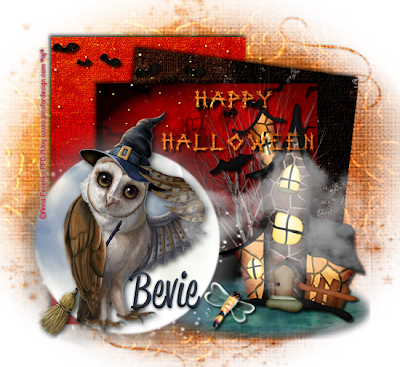 This gorgeous "Haunted Brew" tag was created by Rita of LadyArie's Creations.